« It Was A Bluegill Day! Pretty nippy today with a high in the upper 30s. Sun might come out today, but it better hurry. Rest of the week looks like upper 40s, dry and sunny tomorrow with sunny to partly sunny into next week. Staying dry until possibly next weekend when a 40% chance of rain shows up. Temperatures are in the 40s to 50s most of this time. Same pattern on generation pretty much. Today, however, they say they will run more in the a.m. then keep a low flow all day. They said that a couple days ago but actually shut it down in the middle of the day. At any rate, it should be on in the a.m. and either off or low during most of the day, they back on around 5:00 p.mn. That has been the pattern. Windy day yesterday, but it was Wednesday. And, Jim and Gina were on the water for half a day. A beautiful rainbow certainly made it worthwhile. Plus, they caught several other fish on the Ruby 2. 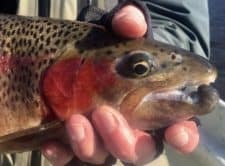 How about the kipe jaw on this gorgeous bow? 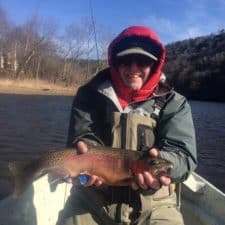 This entry was posted on Thursday, January 26th, 2017 at 12:32 pm	and is filed under Fishing Reports. You can follow any responses to this entry through the RSS 2.0 feed. You can leave a response, or trackback from your own site.